So, you’ve written your press release and distributed it across hundreds of PRWire Asia networks. Despite this, you’re still not getting the attention you’ve been looking for. Unfortunately, this is a scenario we see now and again, and so we began looking into the kind of press releases that generate a non-response from audiences and journalists. Having analysed these case studies, we wanted to share our insights so that our readers can begin creating better Press Releases and seeing the results they’ve always wanted. The simple fact is this: if your press release fails to generate traction, it can be for a wide range of reasons. Writing a press release isn’t enough; you need to write a good one. Today, we’re going to look at the best practices in depth, so you can avoid as many of the common pitfalls as possible and maximize your chances. While there are many different ways to format and formulate a press release, and as we’ve already covered this in some detail, today we’re going to focus on the elements that can make people sit up and pay attention, as well as those that can help you retain that attention, and convert it into action. Journalists are busy, time-pressured people who have to spend a lot of their time verifying facts. As such, the more work you can do for them, the better. If your press release is presented as actual news, you will be much closer to being an “easy win” for journalists, who can simply copy edit and flesh out the PR in order to have an article ready to go. A catchy headline – Your headline needs to read like a headline you’d read in a real publication. If you’ve never seen a news story with a title like yours, then I’m sorry, but your title is wrong. An established angle – Bare facts or information on internal operations does not make news. The word angle is commonly used for camera, and described the perspective through which a scene is shot. Film editors will tell you that the choice of angle determines how people interpret the story unfolding on screen. The same is true in writing. By providing an angle or framing perspective to your story, you do the hardest job on the journalists’ behalf. To do this, you must amplify what is unique, delivering an impactful statement with real implications. “First” and “Last” are the most obvious examples of angle “The first phone to have a teleporter” or “The last surviving Morris Dancer dies”, but there are many other ways to ‘raise the stakes’ of your story. Imagine pitching to someone in the room, and to do so, you pulled out a thesaurus and affected a British accent. You’d be laughed out of the room. One of the most common things we see when it comes to press releases is this kind of pretentious intellectualism. You are speaking directly to a journalist, and to your audience. That means you want them to be able to relate to you. To help people relate, you can use common language, easy to understand plain English, and explain things in a way that they are easily absorbed. No one can get excited about obscure ideas and complex concepts. You need to popularize your ideas in the same way Neil DeGrasse Tyson can popularize astrophysics. Talk to your audience (in third person though, remember!) as if you’re speaking to your own friends. That warmth will translate off the page, and plant a seed in their minds that you are someone they can trust, and would want to spend more time with. This will help increase attention retention immensely, making this one of the most important factors when considering how to write press release copy effectively. The biggest problem we see in unsuccessful press releases is excess length. People are so enthusiastic about sharing every detail they forget to think about what the audience is actually interested in. This is a problem for a few reasons. Long PRs repeat themselves – In almost every press release that come close to 1000 words, we see two or three versions of the same idea, as if the writer couldn’t decide on which phrasing they thought would work best, so included them all. Be brave, make a decision, and cut repetition. All it does it make people confused and cause them to lose the ‘thread’ of your piece. Long PRs have irrelevant information – Almost all long press releases veer off into little cul-de-sacs of ‘related’ information which is so tangential that it doesn’t help anything. If this information is important enough, it deserves its own press release. If not, don’t include it in this one. Long PRs are boring – Even if you do all you can to make your story as important, impactful, and exciting as possible… it probably isn’t that important or exciting after 500 words. Think about it this way – you’re competing with huge cultural events like Game of Thrones, US-Korea Nuclear warfare and Jackie Chan defending Pangolins. You need to make your point fast, get those clicks/contacts, and get out. Long PRs are intimidating – Some people look at the overall ‘shape’ of a piece before they look any further. If it’s a wall of text, they simply won’t even start to read. People want a promise of value, and value comes from concisely delivering what’s needed and nothing else. To maximize the number of eyeballs on your press release, focus on Quality not Quantity. Condense your points, sharpen and focus your message, and use only the most compelling information. Clarity is essential to retention and conversion. You are taking your audience on a journey from passing interest to a purchase or feature, and you need to have a clear sense of direction throughout in order to get them there. Any vagueness, any confusion, and people will sooner disengage than try and figure it out. Support Every Claim – if you say it’s the number one user rated app ever made, you’d better have a source to back it up. It’s also not worth making ambiguous claims that can’t be supported, such as “the best” or “the most exciting” – if there’s no way to qualify it, don’t say it. It just turns people off. Answer All Questions, Even Inferred Ones – Check your work for implications and possible questions. Have a friend who doesn’t work with you look over your PR and ask what it makes them question. Then fill in those gaps. If people are left wondering, their curiosity gap goes unrewarded, and that’s frustrating. Frustration leads to disengagement. Plan Your Journey – each paragraph should be tailored to getting the result you want by the time you reach the end of the press release. Clarity of objectives is just as important as clarity of presentation. We’re visual animals. Moreso even than that, we love moving images. It’s why GIFs are so popular. While I don’t recommend you include a GIF of a cat falling off a table, well-chosen multimedia can augment your release in several ways. An attractive image that has been professionally produced will immediately set you apart from your competitors and help readers understand that this is a quality piece of content. Multimedia such as embedded video can further amplify this effect, and allow you to convey much more information in a way people will positively engage with. Images, video and even GIFs can help break up the text and provide novelty and variety. Consider that journalists read thousands of these releases, and you’ll begin to understand why that’s important. Just as great multimedia can make your press release look more professional, spelling and grammar errors can immediately undermine it. It might be a laborious chore, but make sure you proofread your press release. If you struggle with this, try to read it out loud. This should help you highlight any over complicated sentences or poorly phrased thoughts. Alternatively, you can download the Hemingway app, which will identify a lot of these issues for you and highlight them, so you can simply concentrate on fixing the issues it finds. Don’t take this entry as an insult – professional copywriters make grammatical and spelling errors all the time. They only difference is that they know all good writing is re-writing. You want your press release to get more attention? Well search engine optimisation is all about making sure people can find it in the first place. Search Engine Optimisation means matching your content to what your audience are already out there looking for on sites like Google and Bing. You may be used to integrating SEO into your web content or even your social media posts, but what about your press release? Press releases have a large number of SEO benefits – your brand and backlicks get distributed to hundreds of high traffic, high authority websites with huge audiences. The only way to make the most of that opportunity is by ensuring you’re optimized. Now Get Out There And Grab Your Spotlight! Maximizing your distribution is the best way to maximize the chance of your story getting picked up for coverage, so use PRWire Asia to get your Press Release distributed to international and global level newswires. 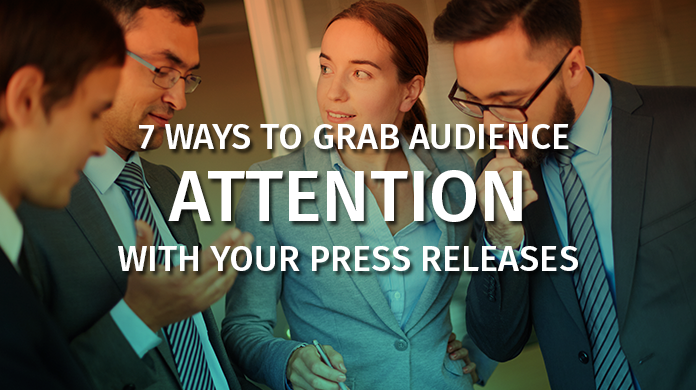 With these tips in mind, your press releases will perform better than ever before. If all this sounds great, but you don’t want to do the writing part, you can create a brief with these ideas in mind, and speak to our professional News PA team to receive a high quality draft of your idea. Alternatively, you can search PR Shelf for helpful templates. Have you succeeded in grabbing attention through press release distribution? Tell us your story in the comments below!